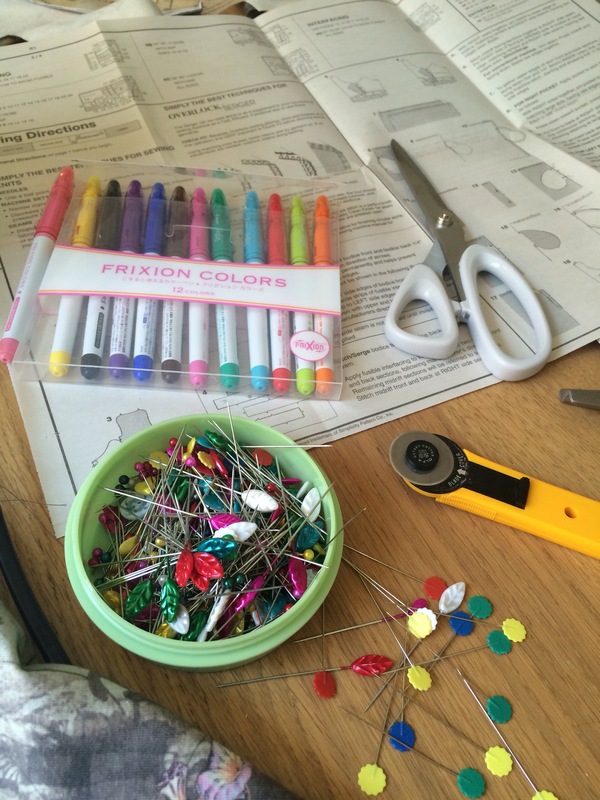 I’ve often mentioned how much I love my Frixion felt tips: how they make the faff of transferring pattern markings to fabric an absolute breeze, and how delightfully simple it is to remove the marks afterwards – the heat from a regular iron makes them vanish instantly. I had also come across a couple of sewists who had cautionary tales – use Frixion at your peril. People had been left with marks on fabrics that refused to fade with heat. Unfortunate for them, but not applicable for me. So, for probably the last 6 months, I had used my Frixions without a second thought, on every garment I made, with no adverse effects. Until last week. I was using a beautiful cotton that I had bought with The Yorkshire Spoolettes for just £5pm. It had a slight sheen to it, which was possibly part of the problem. In addition, I’m not really one to pre-wash fabric before using. Can you see which direction we’re heading in? I used the pens (the black one, to be precise, which just about showed up enough on my navy fabric, in limited February daylight,) to mark the spaces to be used for breast pocket placement, the sections on the sleeves where the gather stitches needed to be placed, as well as internal marks for darts and pleats. Once I had completed the make, I pressed the dress and noticed quickly that the pen wasn’t fading. Or perhaps it was, but the marks – particularly the crosses I had elected to use for the breast pockets, were incredibly obvious. The ink had left behind shiny ghost marks. In several places. It was a make I was otherwise very happy with so this discovery took the wind from my sails somewhat; if I was stuck with these marks I was stuck with an unwearable garment. I tried not to panic (or, more likely, have a tantrum) and consulted Google. I now wish I had taken photos at this stage, like I often do after something has gone wrong and been rectified, but I was too nervous. I found this post. I ordered Amodex, and was relieved to find it was available with Prime delivery. It arrived the next afternoon. I followed the instructions and laundered the dress on a 30 minute cycle. Holding my breath, I pressed it straight from the dryer. The marks had disappeared with out a trace! I was hugely relieved, so thought I would share what had happened with you. 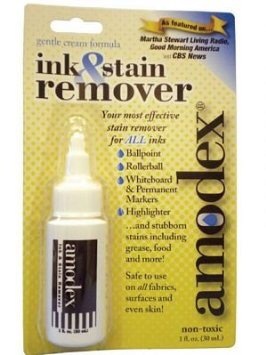 Amodex claims to remove a range of stains, including Sharpie, so I think it’s definitely worthwhile having some to hand. Am I put off using my Frixions? Nope, but I will definitely proceed with more caution. Have you had a similar experience? Or are there are secret sewing weapons you keep to hand, in case of some such emergency? Oh no! Glad it’s all sorted out now as that fabric is lovely! I use Frixion pens sometimes (they don’t show up on every fabric though) and also encountered a problem with my current project. When I ironed over the marks they turned from red to white which was also very obvious. Is this the same thing as what happened to you? It didn’t bother me too much however as all marks were on the reverse. Won’t be using the pens for any marks that will show on the right side! Yes it sounds exactly the same – the ghost marks! I read it’s because the ink is made from 2 things one of which is colour & the other is what reacts to the heat (or something). 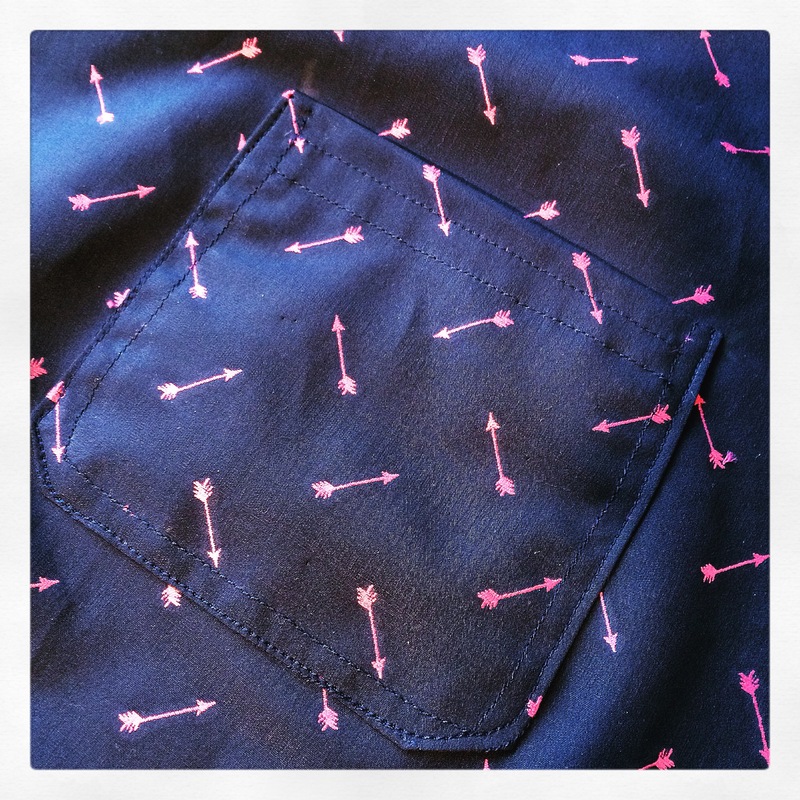 I’m not bothered about internal marks either – it was the crosses on the breast pockets that were particularly unbecoming! I’m still in shock that you don’t pre wash! And it’s not put me off my beloved frictions either but I’m going to order the emergency stain remover – might be useful when the cricket season starts. No worries – I hoped it might spare someone else going through potential trauma as I did. I’m definitely hoping to blog both my A and B dresses very soon – just need to take some photos wearing them both. Phew! I’m glad things turned out ok and I’m really looking forward to seeing photos of this top in all it’s glory! Thank you – I’m hoping I might get some photos taken in daylight this weekend. Fingers crossed! If I hadn’t otherwise loved the make it probably would have been a write off, but it was definitely refreshing to find a solution that worked so well and so quickly! Glad you managed to save it, that fabric is so lovely. When I first started sewing, I never prewashed fabric. Now I prewash and tumble dry everything, unless it’s wool or delicate. I guess it’s most important with knit fabric.